Let’s face it, I’m a sucker for beauty! After donning my wetsuit and hood, in I go! The Gratidudes Matthew and Brad joining me for a dolphin swim in Hawaii; we're singing our Love & Thanks into the Sea! Amidst this exuberance something stings the exposed skin on my neck… Opening my eyes, I’m swimming through a particularly murky current of water. It looks like canal water; full of bits of plastic and floatsam and trash, and I notice myself pulling my energy back in, as if I can avoid coming into contact with it. I catch myself – what am I doing? Trading the adventure of following this school of fish for the reverie of the moment before? Its an epiphany for me… here I am with a beautiful undulating school of fish to follow, coming up to a busy shallow reef that’s buzzing with life, and I want to close my eyes??? You bet! Upcoming – Christmas in Bimini! 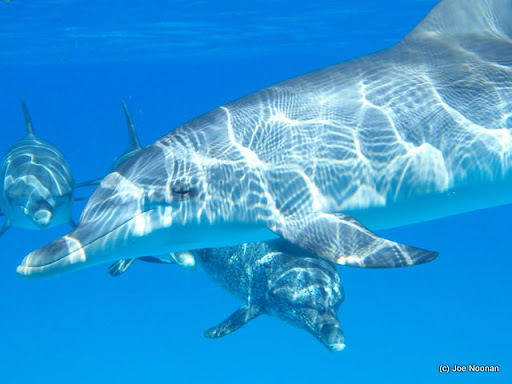 Dec 22 – 26, Swimming with Wild Dolphins & Activating our Joy! Join us this Christmas and meet the 'extended family'! An author, speaker, life coach and spiritual guide, Joe leads leadership retreats around the world and facilitates self awareness programs for those on the path of awakening. Next post: Meet my Manatee Buddies! Swimming with wild Manatees is cool!